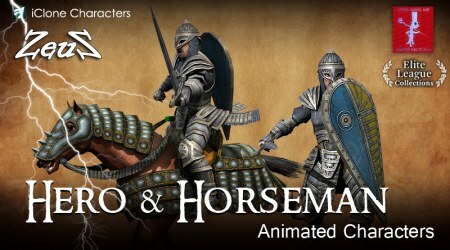 Description: This Hero & Horseman pack includes exquisite hero characters and warhorses which maintain refined visual quality with low poly-counts. Each brave warrior and loyal steed are painstakingly modeled by elite game content developer Necturus, and are perfect for any medieval or battle setting. The Hero character contains plenty of accessories which can be added or removed to create a different look. In addition, the eye and jaw bones can be controlled. The Warhorse includes 3 separate texture layers as well as detailed armor to create a more heavy-duty look. The accessories for both models can be saved separately for use with other characters. This pack also contains 86 general and fighting motions, including horse mount and dismount, sword fighting, swimming, eating, idle and more! Merci beaucoup et encore Merci ZEUS. Thank you very much, Dear friend Zeus! Thank you very much, Dear Zeus!